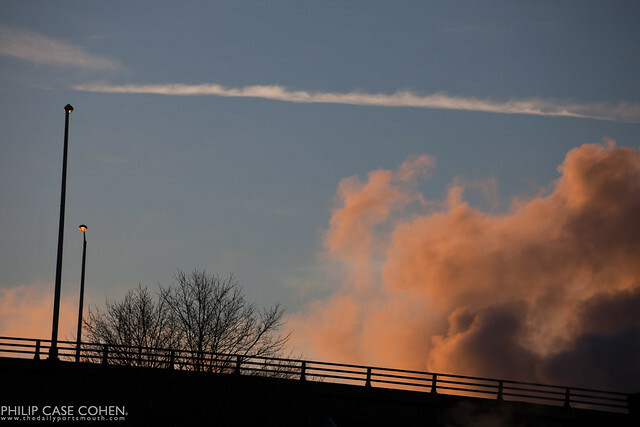 Above the I-95 roadway on the Piscataqua River Bridge, the intense morning light illuminates the moisture being fired into the air by the gypsum plant on the river. The silhouetted bridge is a fun change of pace for me, with some interesting clouds and some cool colors. Another vantage point of a familiar landmark for anyone who has traveled up I-95 to Maine or Portsmouth, and for anyone who has enjoyed a view upriver from The Decks in Portsmouth.